Morning brought tired heads and communal support. The entire camp, now three teams, the Dutch, the Danes and the Americans (us), woke about the same time and started figuring out the next steps for the wrecked Peugeot. 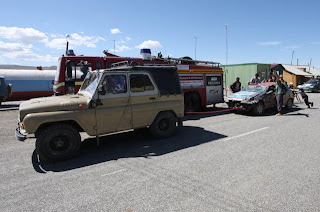 Breaking camp and heading back to the crash site found us meeting with another rally team, Ready to Mongol, made up of six strapping lads from the UK driving a firetruck. A cadre was formed and plans hatched. Dominic and Mike headed off for the local hospital in search of another Dutchman, this one suffering from appendicitis, but with a Russian/English speaking girlfriend in tow. Tracking him down led us to the daughter of the head of local administration who spoke English well and knew everyone including a friend in the customs department at the border. Progress was being made! Our new interpreter rode with us back to the crash and from there proved herself invaluable. The firetruck crew and a local rag and bone man collectively manhandled the broken car onto a flatbed truck and the goal of a border crossing that day started becoming a reality. Then the border closed for lunch from 1:00 pm to 2:00pm. Swarms of children were entertained with, among other things, strips of duct tape. Official forms were filled in and eventually the gates were lifted. The Peugeot along with its team were towed the 20 kilometers across no man’s land ultimately making their way to Mongolian customs. In short that meant ending up in the holding pen like the rest of us. Swifty’s paperwork came through in about 90 minutes and we were on our way. We left behind an English team participating in another rally that had been there for 36 hours waiting for a bank transfer, another Mongol Rally team driving ambulance, and the Dutch crash victims. The Danes and the firetruck both made the crossing in short order.